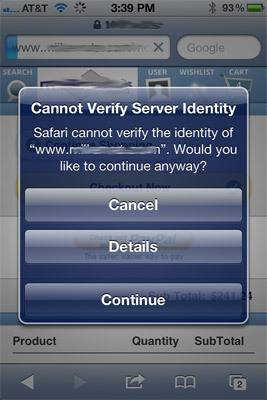 “Cannot verify server identity” – Safari cannot verify the identity of (your domain goes here). The issue is that the supplementary Intermediate SSL certificates, in our case, from GoDaddy, are/were not installed correctly on the server. To resolve this issue, re-download (if needed) the SSL file which includes your SSL cert and the intermediate SSL certs. To install the Intermediate certificate, click Start , and then click Run…. Type mmc, and then click OK. The Microsoft Management Console (Console 1) opens. From the File menu, click Add/Remove Snap-in… . In the Add/Remove Snap-in window, click Add. In the Add Standalone Snap-in window, select Certificates, and then click Add. In the Certificates snap-in window, select Computer Account, and then click Next. In the Select Computer window, select Local Computer, then click Finish. In the Add Standalone Snap-in window, click Close. In the Add/Remove Snap-ins window, click OK. In the Console 1 window, click + to expand the Certificates folder. Right-click Intermediate Certification Authorities, mouse-over All Tasks, and then click Import. In the Certificate Import Wizard, click Next. Click Browse to find the certificate file. In the Open window, select *.p7b for the Files of type. Select the appropriate intermediate certificate file, and then click Open. In the Certificate Import Wizard window, click Next. Select Place all certificates in the following store, and then click Browse. In the Select Certificate Store window, select Intermediate Certification Authorities, and then click OK.
At this point you need to RESTART IIS. After you restart IIS, then your mobile browser should function properly.